Here are some interesting clues to work with. No. 25, the Lake County House, is easy to recognize; some oldsters still remember it as Herrick's Hotel. In 1890, it was owned by John McGreer, who had traded the historic Stone House and its surrounding 960 acres to Charles Marsh Young for the hotel in 1885 Young and/or his sons apparently still owned the Pioneer Livery on the other side of Main Street. It is fairly certain that one of the general stores was owned by C.M. Young's eldest sons, Wirt and Baxter (and later by Young himself), so it seems feasible it would have been the one facing Young's Lake County House. 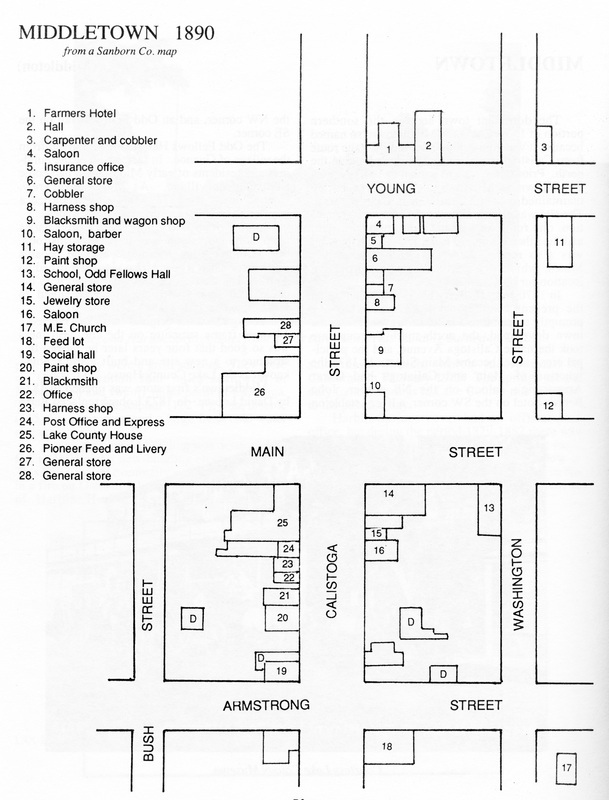 David Lobree owned one of the first general stores in the fledgling town, reportedly next door to a saloon. An 1894 daily journal from the general store of Burmeister & Lewis is in the collection of the Stone House Historical Society. A photo of Calistoga Street, almost certainly taken before 1886, offers more clues. History is pretty hard to trace. All input welcome.